You may remember a little post we did back in April called: Respect the Marathon? It was sparked by an advertisement in Runner's World and the ongoing debate over what is considered "really running" a marathon or not. If you don't remember what this is all about, go check out the post (which had some AMAZING comments, I might add). But the abridged version is in the photo above. Sarah M. (in all her post-marathon glory, below) recently wrote us in personal response to this post and this advertisement. Her email gives me chills -- no joke. Her words are seriously inspiring/motivating . . . and she was nice enough to let us share her thoughts with you all! I have been walking for fitness for about 8 years, and just transitioned into running in 2009. I had completed 5ks, 10ks and three half marathons by walking them, and decided it was time to bump it up a notch. Plus, when you run, you finish faster. I did two half marathons last year, along with the 5ks, 10ks, 10-milers, etc. Somewhere along the way, I was inspired to run a marathon, which I said would never happen, especially 8-10 years ago. But, by God’s awesome grace, I completed my very first full marathon in April. Yes, it took me six hours, but I’m 178 pounds lighter than I used to be. You are right. The marathon is about personal achievement. And, when I crossed that finish line in April, you would have thought I just won Boston. Respecting the marathon is about the hour upon grueling hour you put into it the months and years leading up to it. Respecting the marathon is writing the check, turning in your registration and believing that you can do it. You will do it, whatever it takes. Respecting the marathon is, when the race course splits, following the full marathon route, not the half marathon route. Respecting the marathon is not giving up at mile 18. Respecting the marathon is meeting God at mile 23. 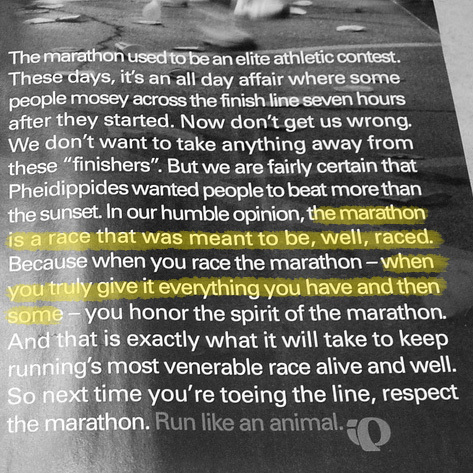 Respecting the marathon is putting one foot in front of the other. Respecting the marathon is watching the mile markers increase with every step from 23, 24 and 25. Respecting the marathon is having nothing left in you to give, but euphoria washing over you when you cross the 26 mile marker. Respecting the marathon is finishing, whether you are crossing the finish line in 3:02 or 6:02. 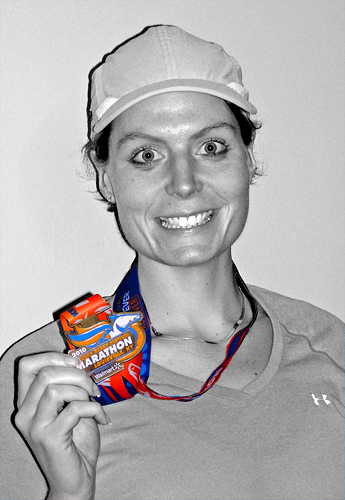 Respecting the marathon is wearing the medal with pride, and wanting to do it again. I’m not an elitist, and I’m not as hard-core as some of those athletes, but somewhere along this journey, I’ve come to the conclusion that I am an athlete too. So, I hope you all enjoy and take as much from her words as we did. Sarah is truly an inspiration, a voice for the true spirit of the marathon. So, again, Sarah, thank you so much for taking the time to write us this amazing message! And if you have a story about your own journey toward a healthy life you'd like to tell us, just shoot us an email at neverhomemaker [at] gmail [dot] com. You may even be featured on the blog! Labels: guest post, health, inspiration, life, marathon running, motivation, respect the marathon, running, sarah m.